Nothing more than a surface parking lot during the 1970s, today residents affectionately call Pioneer Courthouse Square in Portland, Oregon, their downtown "living room." More than 300 activities take place in the square each year, making it one of the most-visited public sites in the entire state. 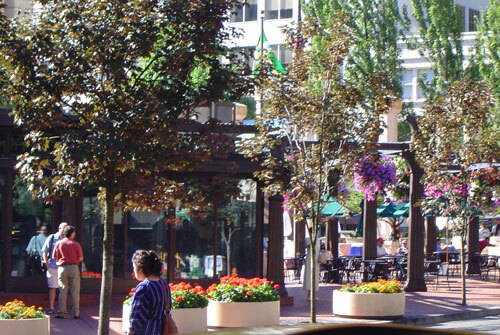 The American Planning Association (APA) is designating Pioneer Courthouse Square one of 10 Great Public Spaces for 2008, noting its role as the city's central downtown meeting place, its integration with transit, and the precedent it set for other revitalization projects in Portland. Hanging plants create a canopy during a flower exhibition and festival. Photo Courtesy of Brooke Taylor. "All of the great cities of the world have squares," says David Porter, former executive director of Pioneer Courthouse Square. "Their functions may have changed over time, but they're rooted in the tradition of gathering, of community, of people-watching, of seeing and being seen." Its popularity in Portland is without equal, attracting 26,000 residents, workers, and tourists every day, or nearly 10 million visitors a year. Some events, like the holiday tree-lighting ceremony in November, bring as many as 10,000 people "packed shoulder-to-shoulder," reports The Oregonian. First proposed in Portland's 1972 Downtown Plan, the city purchased the land from its owners, the Frank & Meier department store, and held a design competition for the space in 1980. 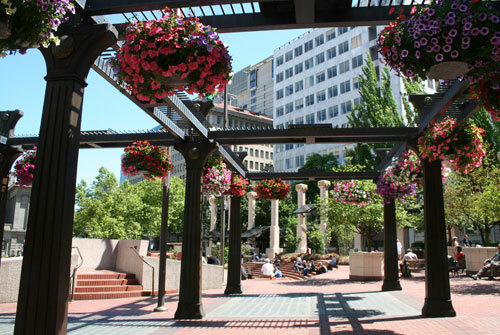 A Portland design team won the competition, but no funds were available for implementation, leading then-Mayor Frank Ivancie to declare the square dead in 1981. 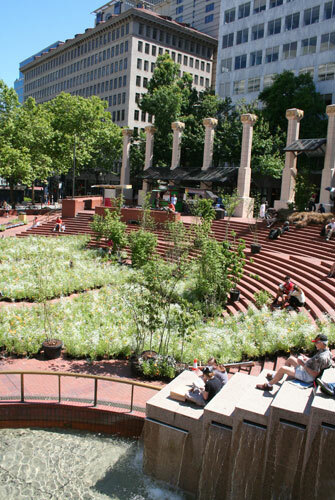 The following year the group "Friends of Pioneer Square" was formed and raised $1.5 million so the plan for the square could be realized. Although part of the city's park system, the square is more of a plaza or zócalo, notes design team landscape architect Doug Macy. The public space, bordered by SW Morrison on the north, SW Yamhill on the south, SW 6th to the east, and SW Broadway on the west, is surrounded by buildings with ground-floor activity on all four sides. Framing the northern and southern boundaries of the square are mature maple trees and Greek terra cotta stoa columns. Within these borders the space is subtly divided into two levels to accommodate a west-to-east grade change that provides a massive, centralized arc of amphitheater seating. Other features include more casual places to sit, food and beverage vendors, and an echo chamber for smaller, more intimate events. Pioneer Courthouse Square adds colorful tones to the surrounding area. Photo Courtesy of the Pioneer Courthouse Square Inc.
Public art serves as an iconic anchor and reminder of Portland's history. The famed "Allow Me" bronze statue — or Umbrella Man — invites visitors to the square while a game of chess on permanent chessboards entice people to stay. A segment of the Portland Hotel's original entry gate remains along Southwest Sixth Avenue, a reminder of the block's history. To reinforce the connection with the surrounding neighborhood, a unique brick paving pattern used in the square continues across the street to the sidewalk in front of Pioneer Courthouse, the square's namesake and one of the country's oldest functioning federal courthouses. The square also is seamlessly tied to Portland's Metropolitan Area Express (MAX) light rail system. Transit stations are located on both the northern and southern sides with a third station planned to open in 2009 along the eastern perimeter on SW 6th Avenue. From outdoor movies and sand castle building to snowboarding, wine tasting, political rallies, and people watching, the square is in constant use. "So much is happening in this city, and it happens right here in this square," says former Mayor Vera Katz. The amphitheatre is used as seating for summer events and programs. Photo Courtesy of Brooke Taylor.